We are a little fond of bunting at Love Mae. Yes we have jumped on the 'bunting' band wagon and enjoying the ride. Seeing that Christmas is this Sunday we are here to help you decorate your festive parties. 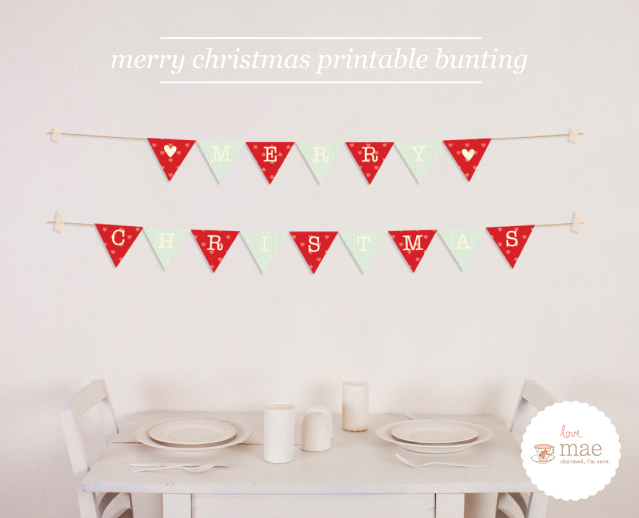 It couldn't get any easier than this sweet Printable Merry Christmas Bunting. Simply download, print and hang on your wall or door way. Simply Print, Cut, Tape or Staple to String, then Hang. We would like to take this moment to say... Merry Christmas! It has been a pleasure to help your creativity flow this Christmas. This is the last of our Christmas Freebies so please enjoy the holidays and we will see you in the new year. How cute is this!!!!! Thank you so much!!! Thank you so much, you're so generous! love & adore this, thank you dear! i have been wanting to find something like this to make for our living room. thankyou so much, would have probably gone out and paid an arm and a leg for one, and i love this soo much!! Thankyou!! Thank you for the pretty bunting sign. You're the best! Merry Christmas to you and yours.